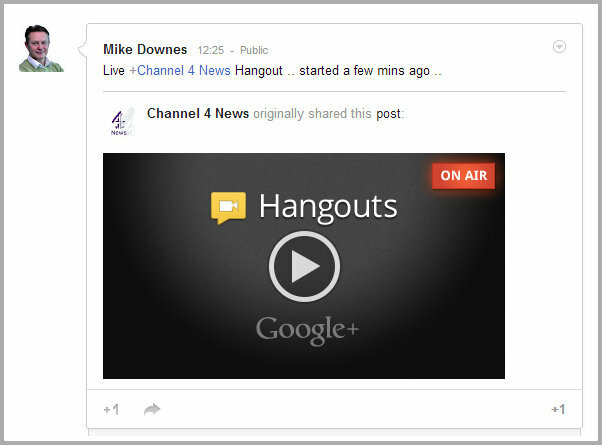 Channel 4 held their first Hangout On Air today. This post is providing all the speaker information and links to negotiate through the broadcast. 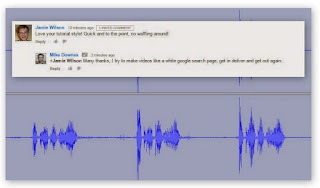 To develop HOAs (Hangouts On Air) further, it necessary to understand the timeline of posting and sharing. Gone are the days when you turn on the TV at 6pm and simply watch. HOAs can open in seconds, when news breaks so we need no studio, no production staff or specialist equipment. For me, the focus is what was said and the speed. This is a lively hangout with people interrupting all the time, which is an excellent example to test the technology. From the initial Google+ post and the Event page we had the title: Will you ever trust the media again? 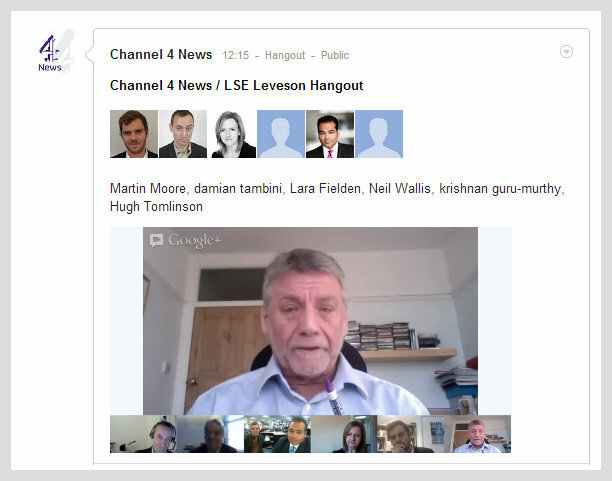 A post-Leveson Hangout with C4 News and LSE ( posted 29 Nov 12, 4:33pm). Ten minutes prior to that, the Channel 4 News website posted (reshared at Google+). 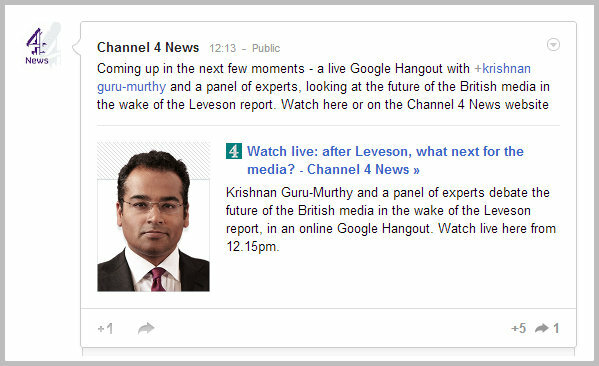 Krishnan Guru-Murthy and a panel of experts debate the future of the British media in the wake of the Leveson report, in an online Google Hangout. Watch the Google Hangout again below - or if you can't see the video, you can watch the Hangout on our YouTube channel by clicking here or on our Google+ page here. Chaired by Krishnan Guru-Murthy, the panel also includes: Charlie Beckett and Damian Tambini, London School of Economics, Neil Wallis, ex News of The World, Lara Fielden, Reuters Institute, Martin Moore, Media Standards Trust and founder of Hacked Off and Hugh Tomlinson QC, Matrix Chambers. When the HOA started, we often share. When we, as Google+ users do this, all that sends to the stream is a blank player. I posted these comments in response to a suggestion: I wish shares would include the participants. I also commented: The other issue, is I've spent 5 mins trying to find out who these people are. I'm delighted for C4 to have this hangout, you will see the users are displaying pretty much nothing about themselves (accounts must have been setup for this purpose) .. When you Google the names, there are some real players here. The best we can work on is beefing up the Google Event page, G+ post, embedded blog as more of these happen .. One real issue is, on creation, we can only enter a HOA title, that's it .. NO description of the event (so no names, links , real shame).